Happy Friday, Friends!!! Before I dive into my weekly favorites, HAPPY BIRTHDAY, LUKE!!! First up on the list is Jack Bauer. We lovingly call him "pop a squat" because if anyone is sitting (even just for a second, like to tie your shoes), he pops a squat in their lap and expects some back rubs. Scratches are his FAVORITE. Y'all should know by now that Evys Tree is one of my most FAVORITE companies EVER! They sent me a new hoodie last week and it's precious!!! It's the new Ava Racer and it's fabulous... even when you're about to spend your morning cleaning up after a sleepover. And Griffin's FAVORITE is drinking my tea in the morning. Or who Luke is having a date night with in this pic??? I couldn't resist these jeans or this kimono and I'm on my a-game and picked up this shirt for Mason for July 4th. I already have the tunic below, but if you've been eyeing it, it's now on sale! Last week we got to spend some time with one of our FAVORITE girlies. I snapped a couple pictures of Manda's sweet girl to text her and LOVE how they turned out. Narci is always so great with my kids... and yes... that's Luke posing in the bluebonnets with one of his Lego bionicles. All Luke wanted to do was take a picture of his guy in the bluebonnets. Mission accomplished. Tuesday night Dave took Luke to his first Dallas Stars game. He had a few suite tickets and so Luke got to tag along with Dave, Dave's brother, Stephen, and a few of Dave's friends. 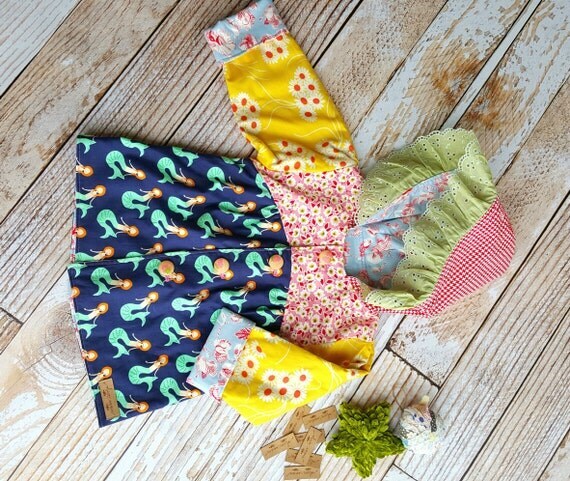 Griffin's ADORABLE jacket is from a new FAVORITE Etsy Shop - Olive Annie Designs. 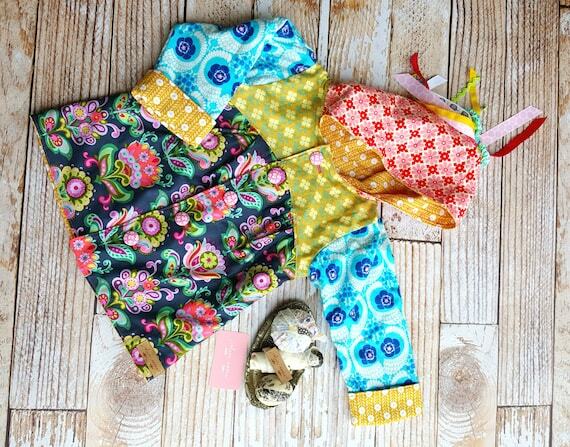 The fabrics are seriously incredible and you won't believe the workmanship and quality. Griffin is in a size 3, and it fits her now and it will fit her for at least a few more seasons. I don't keep much of Griffin's clothing, but this is a piece I'll be holding onto forever. Blowing dandelions was up next on the agenda and it was pure cuteness. I mean! Look at that hood!!! PS - This post contained affiliate links, which means that if you cilicied on a link and purchased an item, I may receive a small commission. Also, THANK YOU to Olive Annie for providing readers with the free shipping code and a jacket for GG. You rock!!! So much goodness in one post! First of all, Happy Birthday Luke!!! I hope he has the best day! Ahhhh!!!! That baby picture of Luke and Ebby Lee...they were so tiny!!! And your comment about looking like that while you picked popcorn out of the couch made me lol!!! Oh Andrea! The bluebonnet pictures are so cute!! And the throwback pics are too :). Awwwwwwwwwwwwwwwwwwwwwwwwwwwwwwwwwwwwwwwww! I recognize that squished little nose!!!! BABY CARTER!!!!!!!!! Okay, now I"m going to be forced to walk down memory lane as well. Cue me spending the next 45 minutes or so on my old family blog. Can't wait to see the bluebonnet pics! Oh, and the Maury pic made me lol. 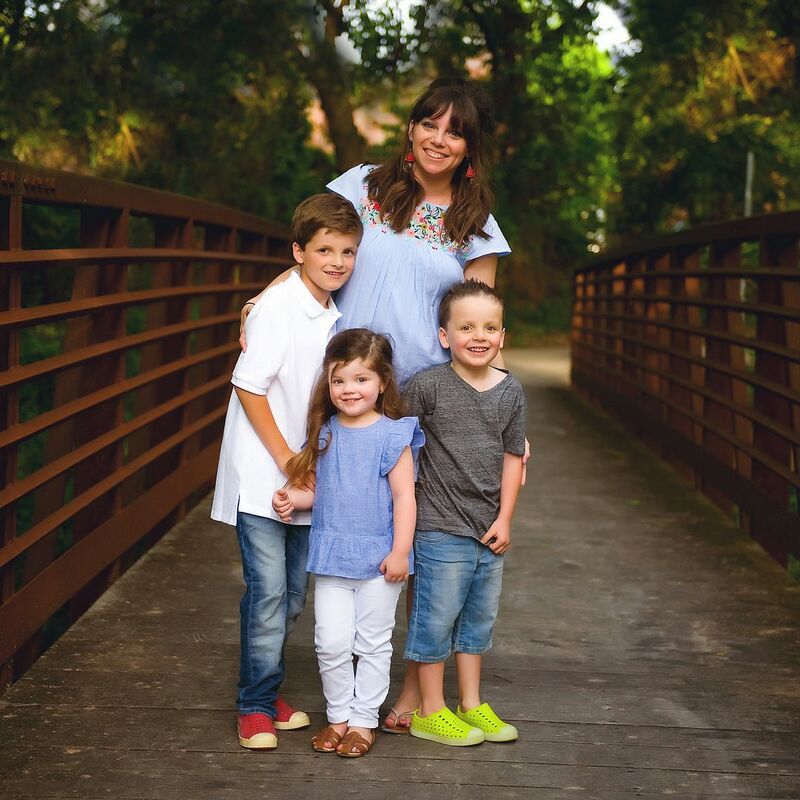 I love those photos of your kids in the bluebonnets! I had such a fun time with your crew!! What a blast! Thank you!! Also, those throwback pictures are so precious!! Love!! Happy Birthday to Luke! XOXO Love the bluebonnets pictures. We don't have fields of those here! The picture of Griffin in the chair made me gasp is was so amazing. Also the one with all three. Reading your blog in the morning puts me in a happy place as I begin my work day! ...while I picked popcorn out of my crotch!!!!!! Precious bluebonnet pictures! Have a good weekend! Such great pictures! 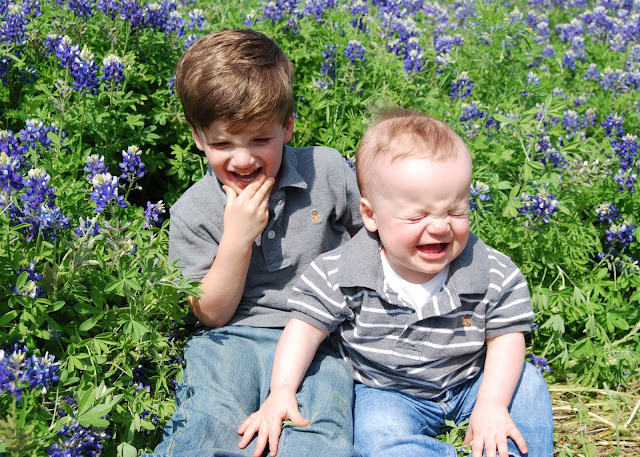 I can't believe how big the kiddos look in the bluebonnet pics! Your family is just adorable and I love how much fun you all have together! Have a great weekend! When did Griffin get to be 10 years old?! :) Little Miss is definitely model status! Love the pic of her posing in the white chair! !